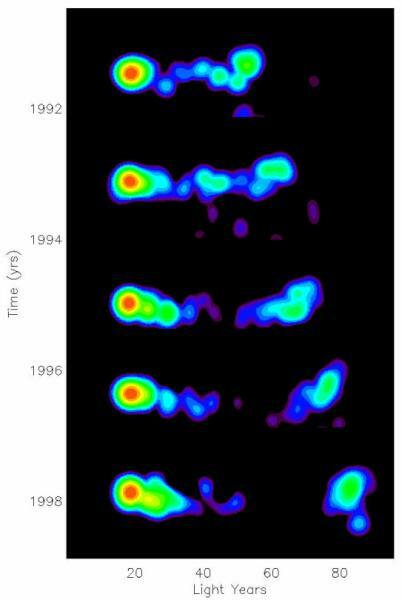 The figure below is a set of radio images of a mass of plasma (a jet) leaving the quasar 3C 279. If you look at the scale at the bottom, this mass of plasma appears to travel about 25 light years in about 7 years. 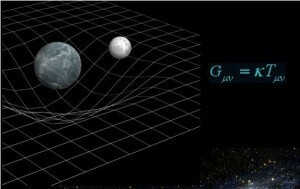 In other words, it appears to be traveling more than 3 times faster than the speed of light. 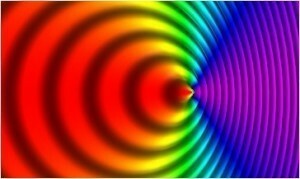 How is this possible if (supposedly) nothing can travel faster than light? 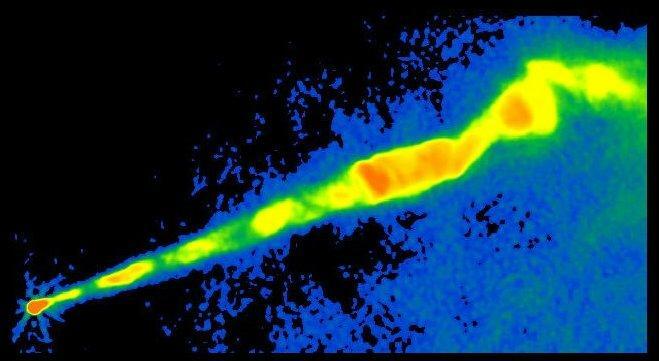 The answer is that such a “superluminal” jet is actually an optical illusion. What’s really happening is that the jet is moving at a large fraction of the speed of light in our general direction. As an example, suppose the jet were to move at an angle from our line of site such that for every 4 light years it moves toward us, it also moves 3 light years across the sky (perpendicular to our line of sight). This means it will have actually traveled 5 light years (think of a 3-4-5 right triangle). Since the jet travels at close to the speed of light, it takes a bit more than 5 years to travel that distance. During this time, the light that left the jet at the beginning has travelled about 5 light years. At this point, the jet has moved 4 light years toward us, so new light from the jet is only about 1 light year behind the light that left at the beginning. This means as the light reaches us, we will observe the beginning to end in only about a year. But the jet has also traveled 3 light years across our field of view. As a result, we will observe an apparent motion of 3 light years in about a year, giving the appearance of superluminal motion.